We make it simple, slim, smooth and above all, at a low price! 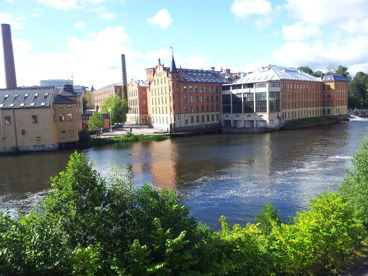 At Pronovahuset in the middle of the tourist area “the Industrial Landscape” in central Norrköping is our discount hostel: Pronova hotel & guesthouse. With views of the sky and even from some windows, view over the city roofs and chimneys, you are literally sleeping in the center but still in peace and quietness. but have the price of a hostel? Pronova hotel & guesthouse like to offer affordable rooms with the standard of a hotel but the price of a hostel. All rooms have a TV and provides free Wi-Fi. The bed is already made and you don’t have to worry about cleaning at all. In most of the twin rooms there are shower and WC. Our single rooms have shared showers and WC’s just outside in the hallway. As our guest you have free access to the kitchen and you can serve yourself from our buffet breakfast in the morning. We want you to have the feeling of a really good bargain when you stay with us, we have the hostel for you who appreciate the easy and close. If you want to treat yourself with luxury, please feel free to ask us about our fantastic sauna with a view over the rooftops of Norrköping.